The 2009 Toyota Cup - the National Youth Competition which runs parallel to the NRL - is nearing its own Finals Series and today announced its Team of the Year. Last year Canberra won the inaugural Toyota Cup and featured three representatives in the Team of the Year in 2008 - sharing the highest number of representatives with the Bulldogs. Significantly 14 of the 17 players named in the 2008 squad have played NRL football in 2009 and only Matthew Mundine and Daniel Harrison are yet to taste the top grade. So the omens are good - make the Toyota Cup Team of the Year and there's some NRL football in your future. The 17 man squad for the 2009 Team of the Year includes a number of players with NRL experience this year and at least one of them will be playing Finals Football in the NRL instead of the NYC this year. Kieran Foran looks like he'll be part of the Sea Eagles charge in the Finals as long as Jamie Lyon is injured, while Jared Waerea-Hargreaves, Joel Romelo, Trent Merrin and possibly Jesse Bromwich could find themselves on the bench for the Sea Eagles, Panthers, Dragons and Storm respectively if injuries strike. Minor Premiers Manly-Warringah and St.George-Illawarra were the best represented teams with four players in the lineup, Melbourne, South Sydney and Canberra had two each, and Penrith, Wests Tigers and the Warriors had one. Of the 2009 Toyota Cup Team of the Year - 8 of the 17 have played NRL football this year. The Finals for the Toyota Cup look decided with the 8th placed Canberra Raiders holding a significant differential advantage over the 9th placed Cowboys - with Nth Qld needing to win by at least 50+ against the Roosters and then rely on the Raiders to losing to Brisbane by at least 30. Top 8: MAN 41, STI 40, MEL 40, WTG 33, BRI 32, WAR 31, SOU 29, CAN 28. Bottom 8: NQL 26, BUL 23, NEW 21, PAR 20, PEN 20, GLD 20, SYD 16, CRO 12. The Minor Premiership race is still wide open with any one of the Sea Eagles, Dragons and Storm capable of taking top spot, while the Tigers must defeat the Bulldogs to secure a Top 4 spot ahead of the Broncos and Warriors. Souths can still finish as high as 6th if the Warriors lose and Canberra could swap with Souths if the Bunnies lose and the Raiders beat the Broncos. 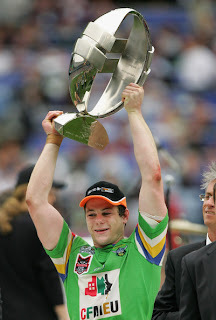 With half of the NRL's teams no longer playing at the completion of Round 26, interest in the Toyota Cup will spike for the Finals Series - especially for fans of the Tigers, Warriors, Rabbitohs and Raiders. The favourites look to be the Dragons and Sea Eagles but don't count out the Raiders if some of their players currently turning out in the NRL are eligible for the Toyota Cup Finals or the Melbourne Storm.